Vermouth. A fortified & aromatized wine that didn’t enter our kitchen (err… Primary Testing Facility) until we became interested in classic cocktails. But, now that it has entered through our doors, which variety is worthy of coveted space in the box-of-cooling? We shall taste test several, “For Great Science!” of course. Many classic cocktails call for some variety of vermouth, and I had never given much thought to this product until I found myself standing, glassy-eyed & hopelessly lost, staring at a proverbial line-up of bottles and had to pick one (I’m certain, it’s that one!). It makes one thankful for having the internet in one’s pocket, especially when reading others’ taste test notes makes you giggle in the liquor aisle. Opinions on vermouth run strong on the internet (as do all opinions it seems), but while we take suggestions, we must see for ourselves which we like best! This leads us to the basic question of: which vermouth makes the best tasting martini when the rest of the recipe is held constant? Based on reading opinions scattered across the internet, I expect that the most easily obtainable (and widely recognized) brand will rank as a least favorite. According to what has been read, there should be discernible differences between all of the chosen varieties, but how they will differ is uncertain. come to the realization that no one in your town sells a desired vermouth. Make a product request, and wait for Noilly Prat to arrive. create “wet” martinis (2 oz gin + 1 oz vermouth, pour over ice, shake for 30 seconds), in parallel if possible. 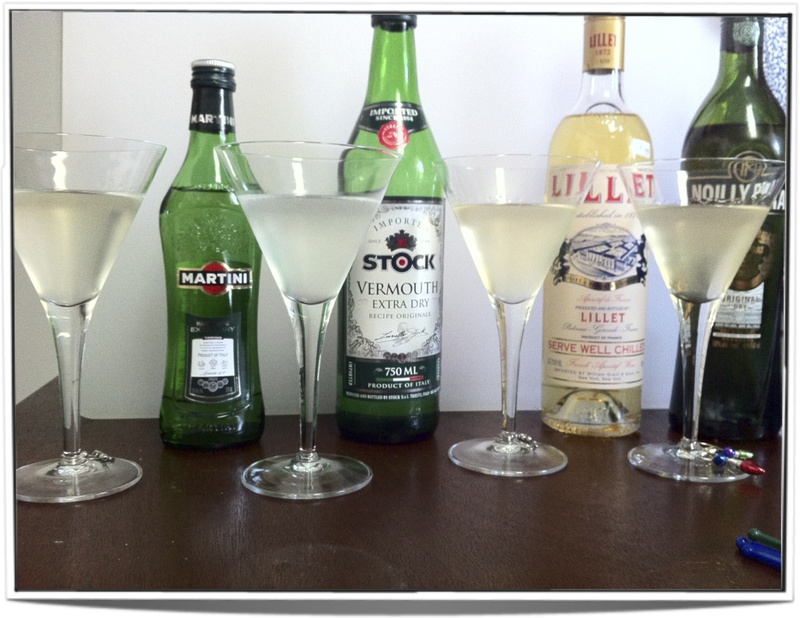 The martinis were prepared with a high content of vermouth (wet) in order to highlight the vermouth flavors. securely close all opened vermouths and put them into the fridge. Use by, or throw out after, 6 month(max)! See the “Related Works” section below for explanations. The chosen gin accompaniments fall neatly into two camps; Italian (Martini & Rossi, Stock) and French (Lillet and Noilly Prat). All four can be found on a lovely map from Vermouth101. Lillet, as mentioned above, is technically a quinquina. This means that unlike the vermouths, Lillet contains quinine similarly to tonic water. The Lillet blanc was the sweetest, and had mead-like properties, with peach and melon flavors. Noilly Prat was also considered to be sweet, but less so than the Lillet, and with citrus and cucumber notes. Stock extra-dry vermouth was very crisp/clean, not sweet at all, and reminiscent of lemon-water. This vermouth also produced the clearest beverage, while the other three had some yellowish coloration. The Martini-Rossi was slightly sweet in comparison to the Stock, and the flavors were considered similar to a watered down white wine. While deemed more “martini-like” than the Stock version, the beverage made with the Stock vermouth was considered more agreeable for drinking as-is. Martinis made with different vermouths. Each martini was made with the vermouth to its right in the photo. apparently everyone in our taste tester group likes their martinis much drier than the 2:1 ratio employed. While we have utilized Seagram’s Extra Dry Gin before in martinis to pleasant results at a 6:1 ratio (3 oz gin to 0.5 oz vermouth), at a 2:1 ratio this gin gets lost in the vermouth. The addition of orange bitters had the most effect in the Italian vermouth-ed martinis. It is believed that it is because the French versions already had a strong bouquet. Unlike previous (undocumented) science at the Primary Testing Facility, the addition of bitters did not seem to affect the overall taste in the wet martinis. Like the gin, it is thought that the vermouth is drowning out the bitters, which are personally known to have a significant and beneficial effect in drier martinis. Our test was inconclusive in terms of picking just one vermouth, and further testing is needed (oh shucks…). Overall, the french vermouths (Lillet and Noilly Prat) were preferred over the Italian varieties, but the 2:1 ratio was considered too “wet” for our tastes (or, more likely, our gin). To rectify the situation for consumption of beverages while watching the new episode of Dr. Who, a set of “frankentinis” was created. Shaking a gin martini is somewhat controversial, which leads to the question: is shaken, stirred, or naked the best method for preparing a gin martini? Note that “naked” in this context equals chilled alcohol going into chilled glasses with no ice contact…. Most recently, we have been making martinis with Seagrams and Stock at a 6:1 ratio. This has been nice and refreshing, and it is wondered if this is because the Seagrams is slightly sweet and the Stock is not sweet at all, but lends citrus notes. Would a more aggressive gin play better in a wet martini, and would the sweetness of the Lillet blanc or Noilly Prat be a benefit in that case? Harry. (March 27, 2011) “When To Say Goodbye: The Expiration on Wine and Vermouth“. Blogger. McGowan. (April 12, 2010). “The Proper Care and Mixing of Vermouth“. WordPress. Zakaria. (Feb 18, 1998). “Toward the Wet Martini: Why vermouth makes the drink“. Slate.